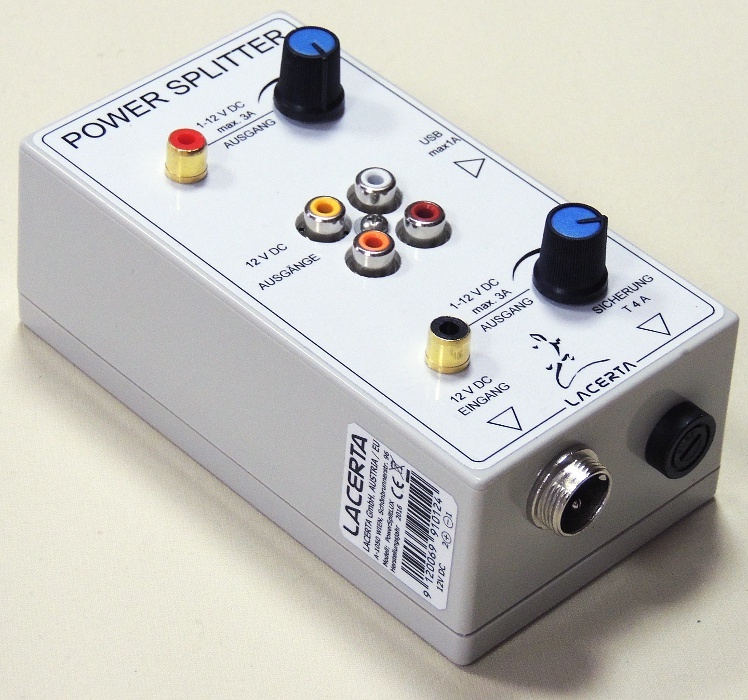 The Lacerta Power Splitter deLux has 7 outlets which can be used for telescope/mount - accessories. He takes care of the power management on the observing spot and supports 7 different devices with one power input line. Input socket is the standard EQ8 socket with screw, to prevent the cable sliding out (stumble trap in the dark). 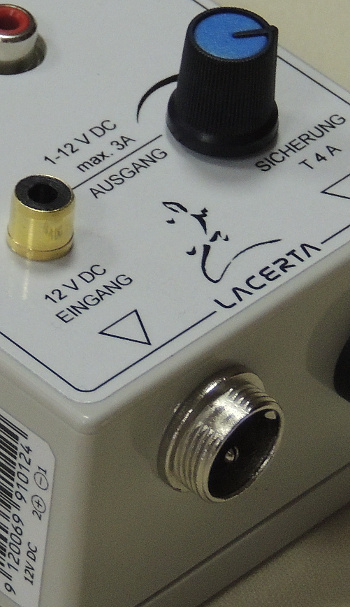 Its also possible to use one of the RCA Inputs to feed 12V power, comes handy for example with using a Li PowerAccu. Caution, then fuse is not active, and we do not take resposibility if anything is damaged. Beside the 4x 12V RCA outputs there are additional 2 individual regulated RCA outputs. The output voltage is adjustable between 1V and 12V under load. (PWM control). Its perfect for heater bands, red backlights, etc. As long as no consumer is at the regualted output there is no power - just after connecting voltage is switched on. on the sidewall is a USB A Socket with 5V / 1A output. The Power splitter utilizes a slow 4A fuse, which fires just on long lasting high currents. This goes well aside with the EQ8Kab - Cable, which utiulizes a Fuse with 5A Peak. 2x 1...12V individually regulated (PWM) e.g. for Heat bands, Flat Field Box, etc. Dont forget to order fitting cables accordingly. 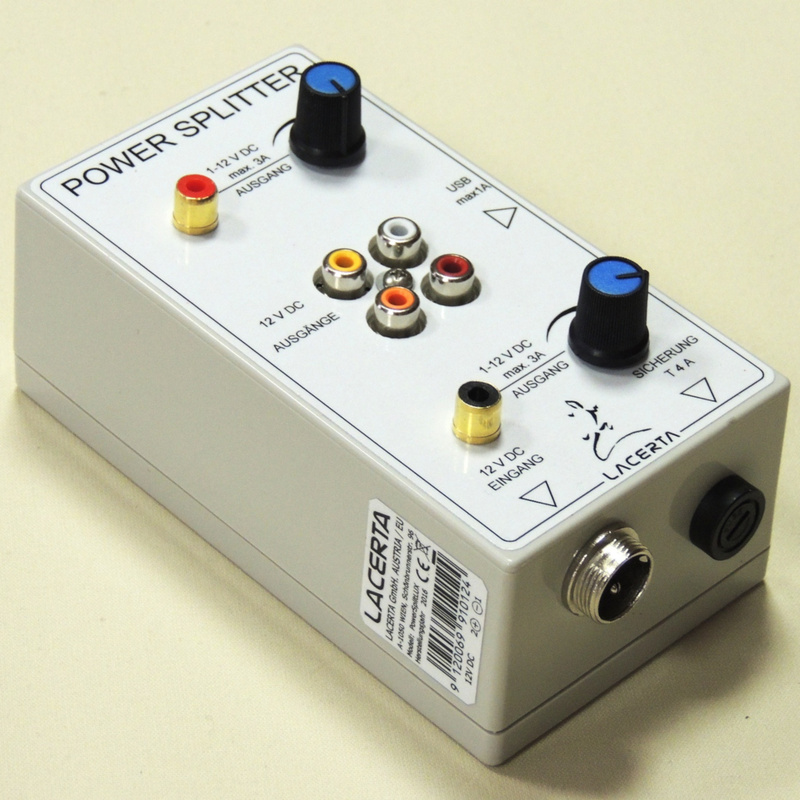 Special Offer: When buying a Lacerta Power Splitter (Power Splitter, Power SplitDim2 or PowerSplitLux), you get the needed cables 50% off. 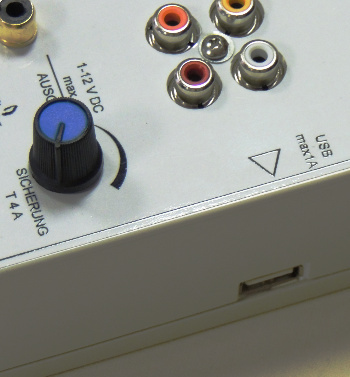 The max Cable count is equal to the sum of inputs and outputs of the device. E.g. for the PowerSplitLux you can order a total of 8 Cables (1x input cable, 6 RCA Cable, 1 USB Cable) discounted.